Do you have a minute to spare to learn some English? Dan delivers the differences between don't mind and doesn't matter. Give us 60 seconds and we'll give you the English! Hi, everyone! Dan for BBC Learning English here. 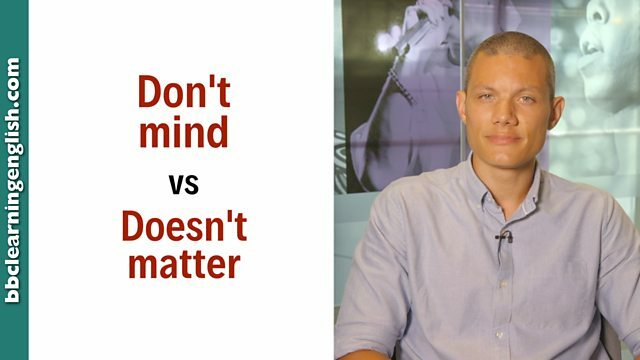 Today we're going to talk about 'don't mind' and 'doesn't matter'. The verb mind means 'dislike, be annoyed by or object to'. It's followed by (verb)ing and often used in negatives and questions. For example: Do you mind opening the window? If someone says 'I don't mind', it means that they have no preference or that they are happy for something to happen. However, the verb matter in English can mean 'be important'. 'English matters,' means 'English is important'. If we say 'it doesn't matter', it means that the thing that we are talking about is not important or not significant. Do you want tea or coffee? OK! Sometimes they can both mean the same thing. Do you want chicken for dinner? The verb mind means 'dislike, be annoyed by or object to'. It's followed by (verb)ing and often used in negatives and questions. If someone says I don't mind, it means that they have no preference or that they are happy for something to happen. I don't mind having tea or coffee. Does he mind you arriving a little late? They're nice people. They won't mind you staying an extra night. The verb matter can mean 'be important'. If we say 'it doesn't matter', it means that the thing that we are talking about is not important or not significant. Be careful - we often say 'it doesn't matter' - 'it' being the situation. If you use a different pronoun - 'you', for example to say that someone doesn't matter, you are saying they are not important. This can be very rude! It doesn't matter what we have for dinner. It doesn't matter where you go. I will always be with you. It doesn't matter why you left. The damage is done. What does 'don't mind' mean? Sometimes they can mean the same thing, but be careful! Which of these answers can NOT complete this sentence: Tom likes all food so ______ what we have for lunch. Does changing the pronoun with one of these verbs make a big difference? Which of these sentences can be quite rude?